Emerging Markets equity sector has been one of the best performing equity funds for the past 3 years. The Asia Pacific sector is among the best sector of this emerging markets fund. 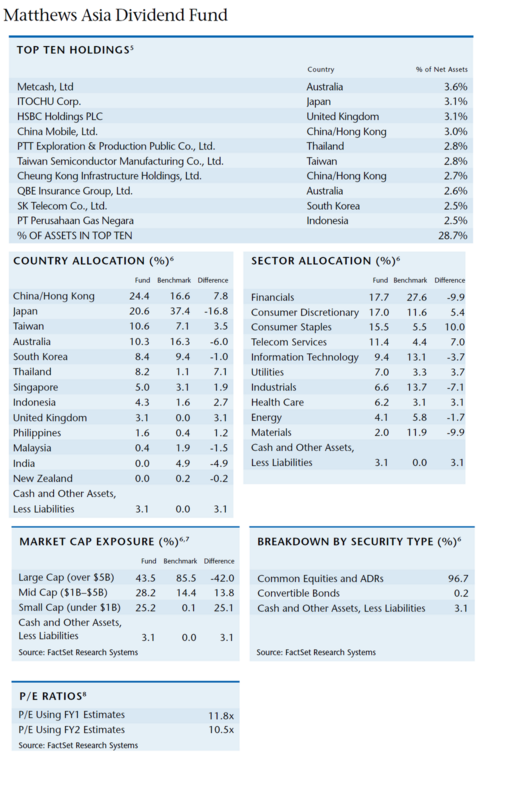 One of this best rated Asia Pacific equity funds is Matthews Asia Dividend fund. Details about this fund can be found below. The Matthews Asia Dividend Investor fund objective is to seek total return with an emphasis on providing current income. The fund typically invests majority of total net assets (>80%) in income-paying publicly traded common stocks, preferred stocks, convertible preferred stocks, and other equity-related instruments of companies located in the Asia Pacific region. This Matthews fund expects to invest in attractive dividend yields companies with possibility to increase their dividends. Jesper Masden has managed the fund since the fund inception in October 30, 2006. The expense ratio of this fund is 1.14% per year. As part of no load fund, this best rated Asia Pacific equity fund has no management fee and no front-end sales load fee. This fund has a yield of 3.19% and it has distributed $0.10 dividend in March 2011. This fund’s total net assets are $2.44 billion. Even though this diversified Asia Pacific equity fund is still new in the market, it has gotten 5-stars return rating from Morningstar. It has 1.58% of YTD return with the best 1-year total return in 2009 with 47.59%. The amount of this expense ratio is lower than the category average (1.59%). It has returned 23.44% over the past one year and 10.18% over the past three years. The minimum balance to invest in brokerage account for this fund is $2,500 with $100 minimum subsequent investment. While for IRA account, the minimum initial investment is $500 with $50 minimum subsequent investment. MAPIX fund can be purchased from 74 brokerages include T Rowe Price, JP Morgan, Td Ameritrade Inc, Schwab Retail, Ameriprise Brokerage, Vanguard NTF, Dreyfus NTF, Fidelity Retail Funds Network, etc. The other class of this fund is Institutional Class (Ticker: MIPIX). The top 10 holdings as of March 2011 are Metcash Ltd (3.6%), Itochu Corp (3.1%), HSBC Holdings PLC (3.1%), China Mobile Ltd (3.0%), PTT Exploration & Production Public Co Ltd (2.8%), Taiwan Semiconductor Manufacturing Co Ltd (2.8%), Cheung Kong Infrastructure Holdings Ltd (2.7%), QBE Insurance Group Ltd (2.6%), SK Telecom Co Ltd (2.5%) and PT Perusahaan Gas Negara (2.5%). These top 10 companies represent 28.7% of total net assets. The top 5 sectors of this MAPIX fund are Financials (17.7%), Consumer Discretionary (17.0%), Consumer Staples (15.5%), Telecom Services (11.4%) and Information Technology (9.4%). And the top countries are China/ Hong Kong (24.4%), Japan (20.6%), Taiwan (10.6%), Australia (10.3%), South Korea (8.4%), Thailand (8.2%) and Singapore (5.0%). Investing in this Matthews Asia Dividend fund involves risks such as foreign investment risks (currency, political instability, and market illiquidity), emerging market risk, stock market risk, volatility risk, etc.